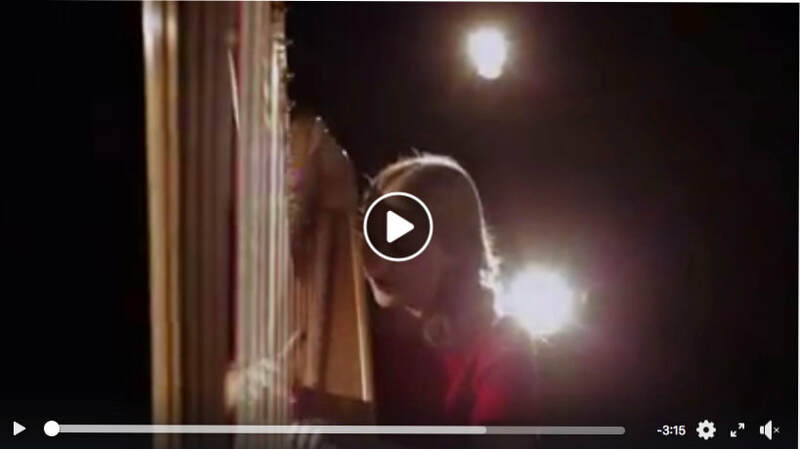 I've just seen this cracking video of Gwenllian Llyr (harp) playing Haldon Evans: Dros y Mynydd [Over the Mountain]. 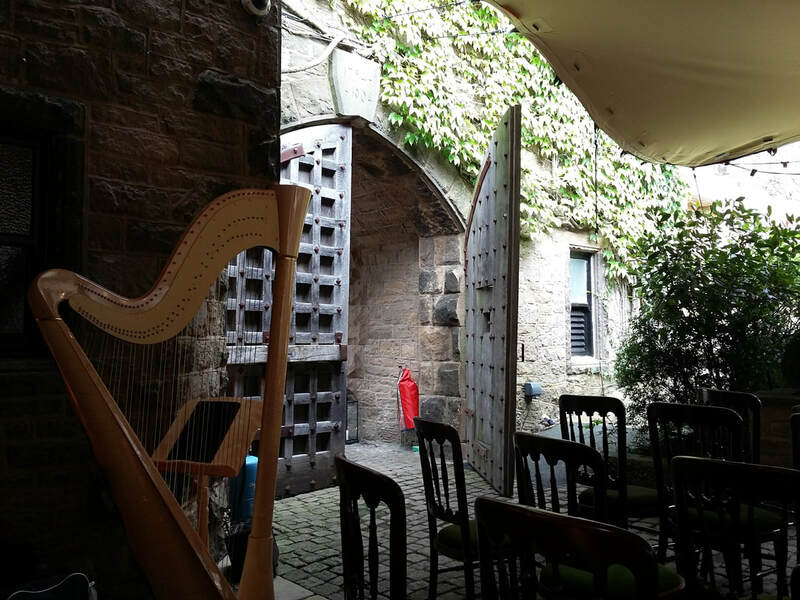 Edinburgh based Polish harpist, Zuzanna Olbrys, has excellent resources on her website HERE which are well worth bookmarking to visit regularly. She has written some really interesting articles which I have enjoyed reading. 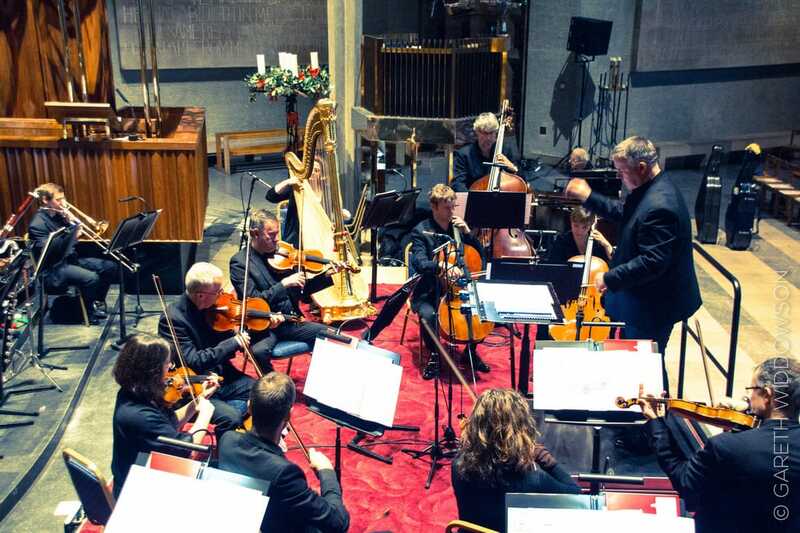 So pleased to hear that the Hermes Experiment, contemporary ensemble with harpist Anne Denholm, has won the mixed ensemble category of the Royal OverSeas League. It's a prestigious competition and great that they have won it. Having spent a lot of today learning some complex contemporary music full of staccato notes, I can SO relate to this cartoon. 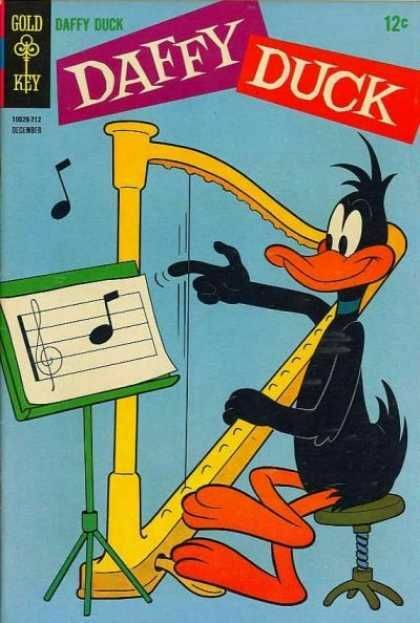 I wish the music I had to learn was more like the music that Daffy Duck is playing! I've just done this chart for a pupil and posting it here in case it's useful for anyone else. It's tricky if you are new to learning to read music at the same time as learning to play the harp. Very easy to get confused when the left hand of the music jumps about between bass clef and treble clef and you are reading ledger lines. It can take a while to work out which octave a note is in! 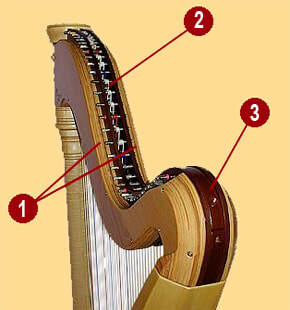 For those new to reading music and harp playing - harpists tend to only use 3-4 ledger lines maximum. Advanced players will read more ledger lines, but 3 is absolutely fine for beginners and intermediate harpists and there is no need to learn to read notes with more ledger lines than that. Composers - If a note needs more than 3 ledger lines than change to a different clef where there aren't any - or use the 8va or 8vb. If you can avoid using ledger lines by using the 8va or 8vb then it's good practice to do so. This chart has lots of ledger lines that we wouldn't normally use and are there just for note comparison. ​Hopefully this chart will help those new to the harp who are also learning to read music at the same time. I can't believe I haven't done a blog post about this brilliant short film before now on 'Une Chatelaine en sa Tour' by Faure. ​Here, Alexander Rider plays this seminal work for harp on an original Erard harp from 1902. Alex also introduces a little of the work's history and that of its creator, the harpist Micheline Kahn (1889-1987). As well as being a wonderful musician, Alex seems to have an encyclopaedic knowledge on harp history and is also one of the nicest people I know! When Alex isn't busy performing or researching, he generously shares his knowledge with other harpists as Editor of the UKHA HARP magazine. 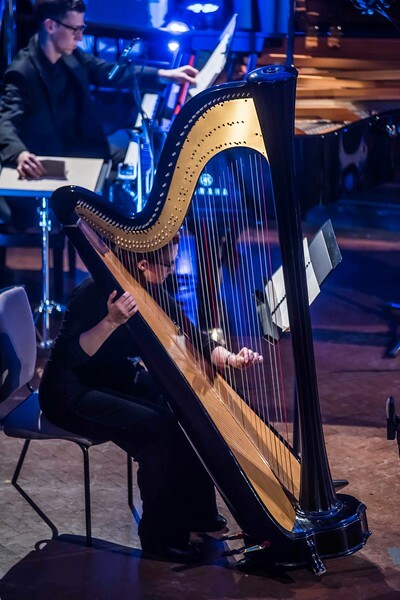 For the past few six months I have been involved in the 'Composing for Harp' scheme being run by the contemporary music group based in Manchester, Psappha. 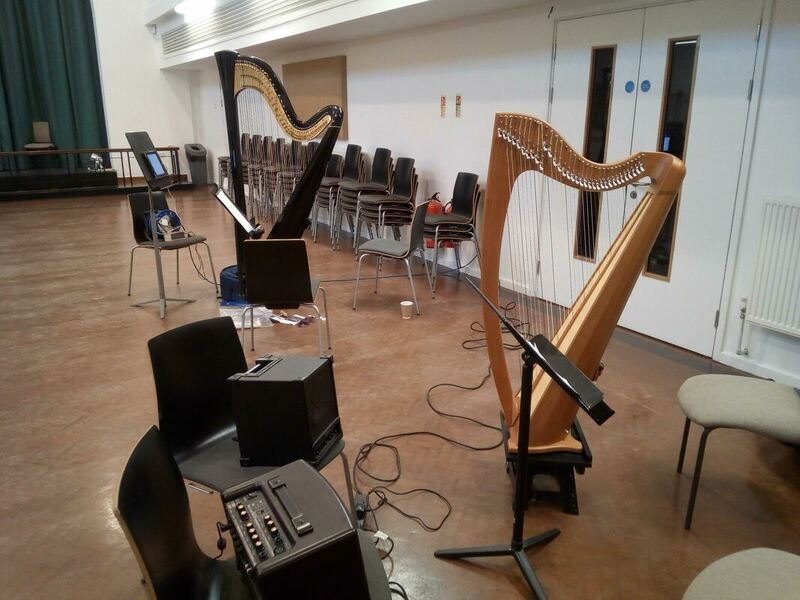 Six young composers were selected to write a new 5 minute piece for solo harp and so far I have had three workshops with each of them as they have developed ideas for their compositions. Each of the works have been very different in style and I was delighted that two of the composers chose to write a piece for lever harp - all the other pieces have been written for pedal harp. Both pieces for lever harp utilise pedals as my Starfish lever harp has a built in pick-up. 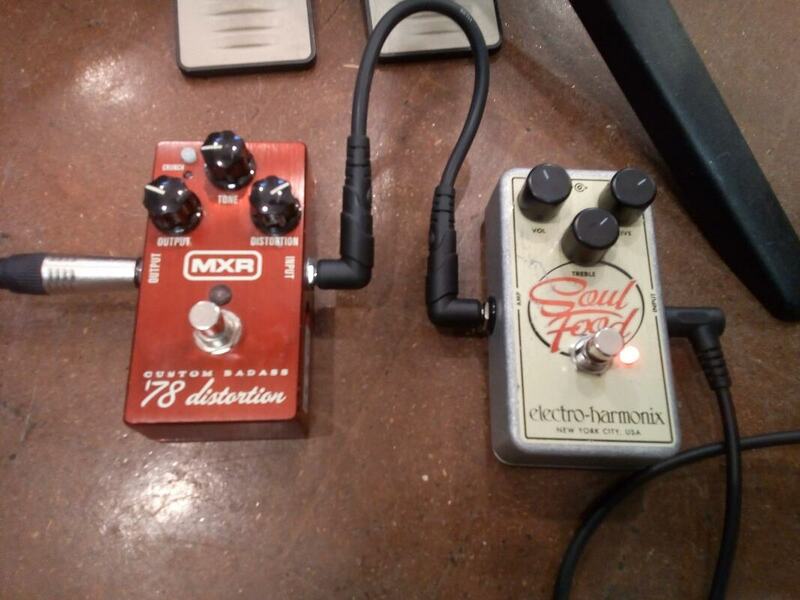 One of the pieces uses these pedals, and the other piece uses electronics and a volume pedal. 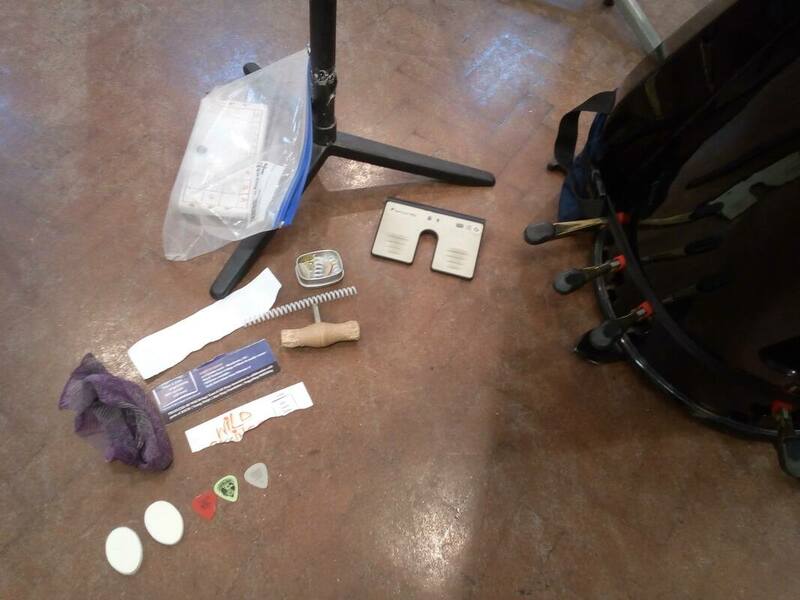 One of the compositions for the pedal harp utilises a lot of preparation. This is a photo from the first workshop when we were trying out sounds. That piece has now developed into using coils, paperclips, a pencil with rubber grip, lots of card and picks. One of the compositions is a tricky one to count with interesting sub-divisions and uses clever de-tuning of some strategic notes. The other two pieces for concert harp are (surprisingly) tonal. They are all very different in compositional style and I have really enjoyed working on them so far. Having gone through a few drafts, the final versions of the pieces are imminent and due in in a few weeks time. I'll then be recording all of them in a daylong session in May where they will be filmed. The resulting final videos will be uploaded to Psappha's impressive library of compositions that they have supported since they started doing this scheme. It's been an interesting project working with 6 composers at one time and I'm very much looking forward to recording all of these pieces. 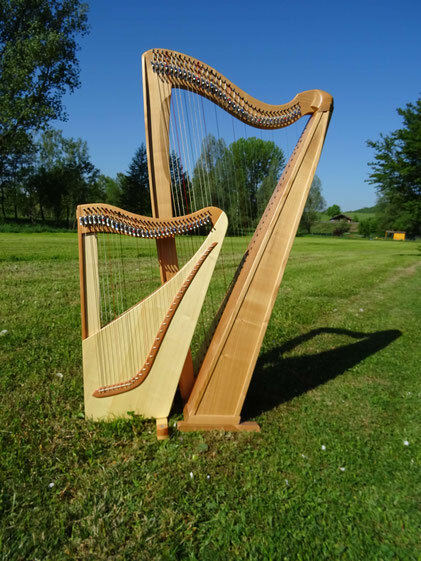 A new harp to add to my wish list...​ a 32 string travel harp built by Alexander Tremer in Germany. Technically it's not a harp because the strings feed to the side, but it's strung and played as one. It only weighs 3.3 kg and it can be carried in a specially designed back pack. I suspect it will also fit into a large suitcase. 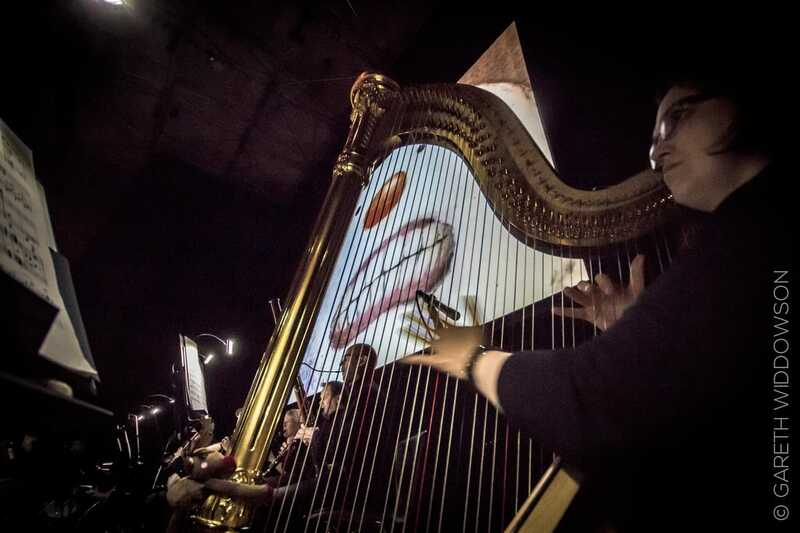 For a small harp the sound is HUGE as you can hear on this video played by harpist, Amélie Guiboux playing a cover of Get Lucky by Daft Punk on her Luna harp. 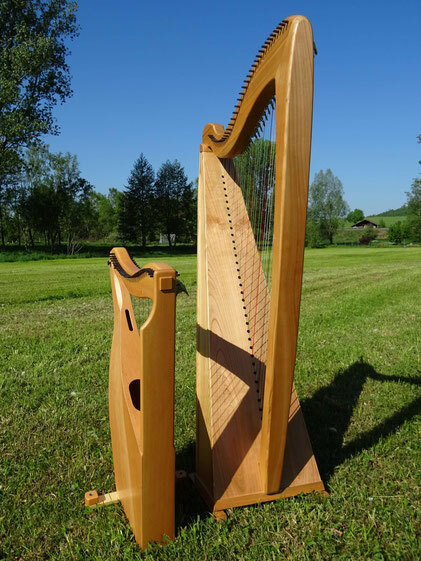 You can get a good idea about the size comparison with a normal 34 string harp with this picture from the Luna harp website. I've had a quick play on one and despite it looking a little odd (and it not technically being a harp) I'm really impressed. It's well worth having a good look on their website which has lots of info about this harp. Bertie bonus - it's now comes with Camac levers as standard! I've been making a concerted effort of late to sort out all the arrangements I have done over the years and to start publishing them. 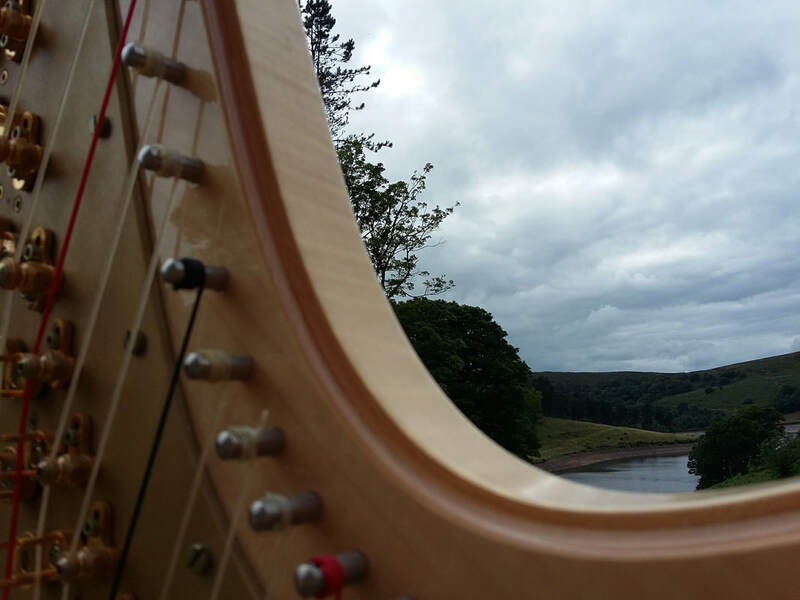 The latest of which is my arrangement of The Arrival of the Queen of Sheba for two pedal harps. I arranged this back in 2013 for some duo gigs I was doing with my good friend and wonderful harpist, Eleanor Hudson. The idea behind the arrangement was to split the melody line up so that it worked stereophonically between the two harps. 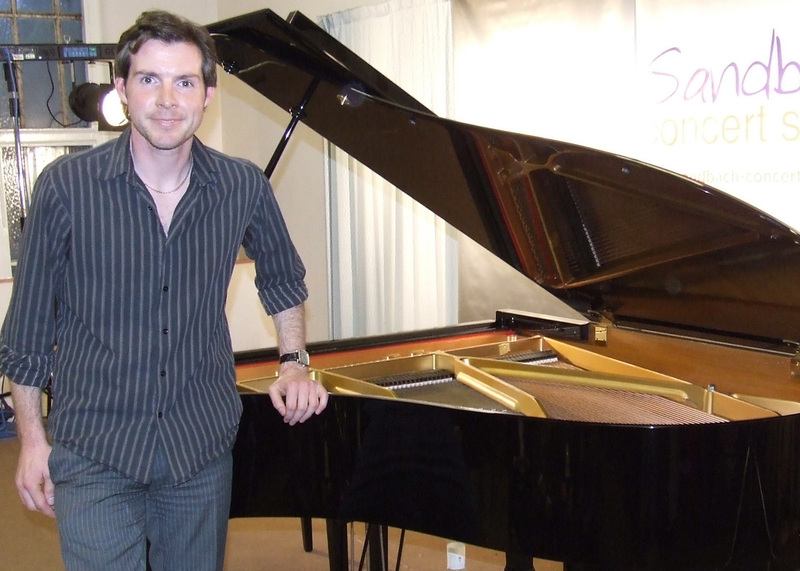 The Queen of Sheba is an often requested piece for wedding ceremonies and the melody line is quite tricky to play solo. So the inspiration of splitting the melody line was so that it could be played at a much faster speed than one would normally be used to playing it as a solo. It's great fun to play, but you have to be careful to work hard as an ensemble to make sure the melody line sounds like one harp. A list of all my published arrangements is here and I'll update it as and when I have new harp arrangements ready. It's available to purchase as a download from my online shop on this website and hard copies can be purchased direct from the publisher here. I'm delighted that the good people at Harps North West are using my arrangements of Pure Imagination for lever harp as part of their JaNEWary challenge. They are using two versions of my arrangements for lever harp. The first version is a more straight forward version with no lever changes, and the second version is more complex with lever changes. The pieces are broken up into small sections and they have special teaching videos and play-along videos presented by the very brilliant and inspiring Mary Dunsford. If you want to join in and learn the arrangements as part of this months challenge you can head over to their website or their facebook page. I'm looking forward to giving a workshop on extended techniques at the Harps North West summer camp later this year. 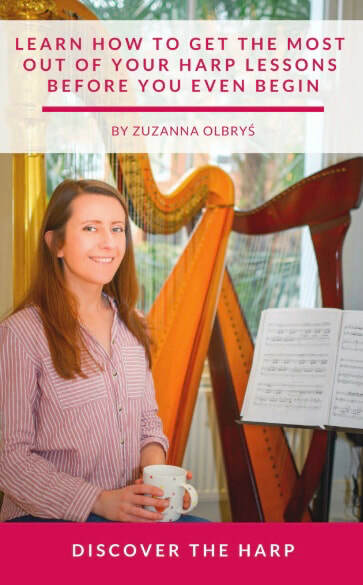 I started publishing my harp arrangements last year and Pure Imagination from Charlie and the Chocolate Factory is available as one PDF containing all three versions which is perfect for teaching all levels of harpists. For beginner to intermediate harpists complete with carefully thought through lever markings and pedalling. 1. Easy lever harp with no lever changes 2. intermediate lever harp with lever changes 3. intermediate pedal harp. I was just re-visiting a lovely video of the great jazz standard, 'My One & Only Love' by the bass guitar & harp duo 2tone, when I came across this jazz harp duo version of Ravel's Introduction & Allegro by Cindy Hortsman. 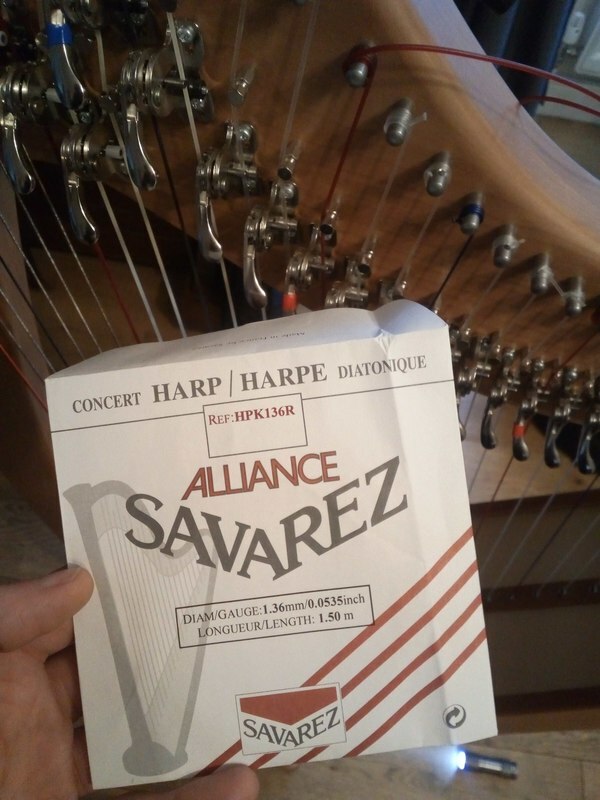 I wasn't quite sure at first what to expect when I saw it was a harp duo jazz arrangement of such a well known and well loved seminal piece in the harp repertoire. But, I really quite like it! ​I think I may have posted this following video of 2tone playing My One and Only Love on this blog before. But it's well worth posting again as it's a really beautiful rendition, with an equally beautifully filmed video of Cindy Hortsman on harp & Michael Medina on bass guitar. Sometimes you can end up down the strangest paths when looking on the internet, and during a late night browse, just by chance I came upon the harp maker Otto Zangerle and his harps. 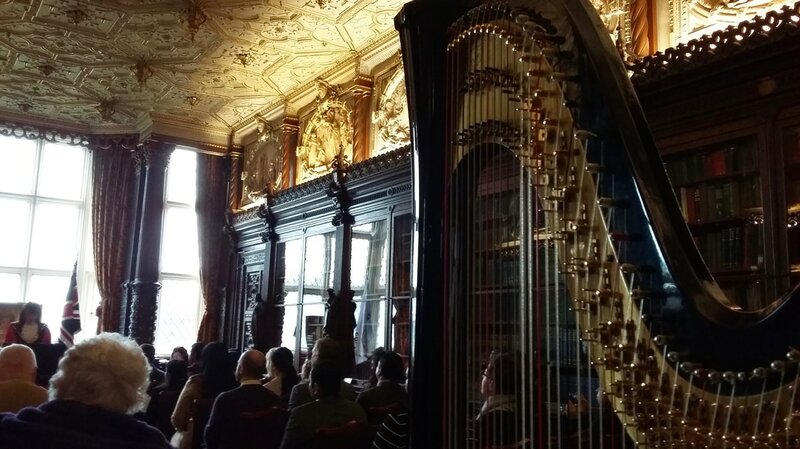 If anyone has seen any of these harps in real life, or has heard them being played I would LOVE to know more about them. If you haven't had a good browse around the website then buckle up and have a good browse at these innovative Austrian harps. It's always a pleasure to play with the Psappha Ensemble, and I had a blast playing in Steve Mackey's epic piece, 'Deal' with them. ​I'm not usually happy sitting right behind a drum kit on stage, but it was an absolute pleasure sitting behind Mike Smith for this gig. Wonderful musicianship on display in this video by Mike Smith & Mike Walker on guitar with Psappha Ensemble whilst I spent most of my time furiously subdividing & counting bars! 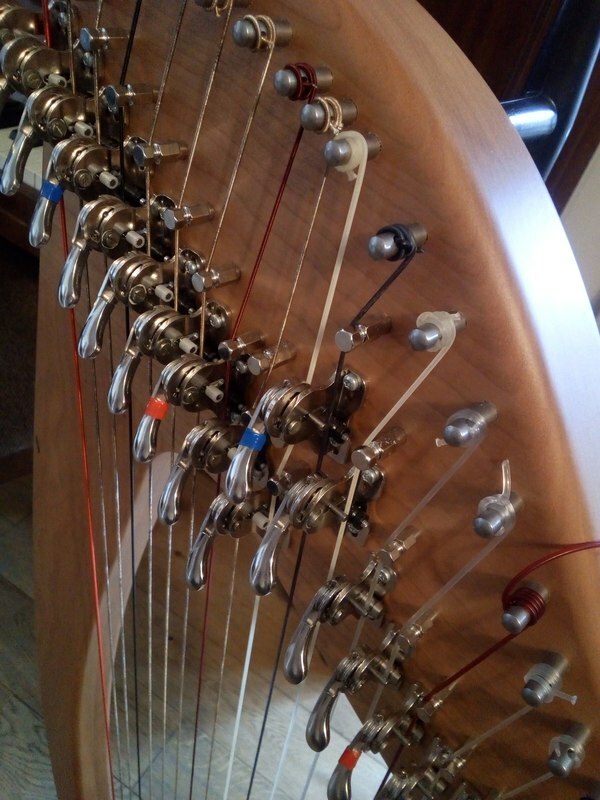 In the continuing saga of the radical re-stringing I'm doing on my lever harp; having changed all the gut strings to carbon fibre & nylon the original wire strings didn't sound great and needed changing. 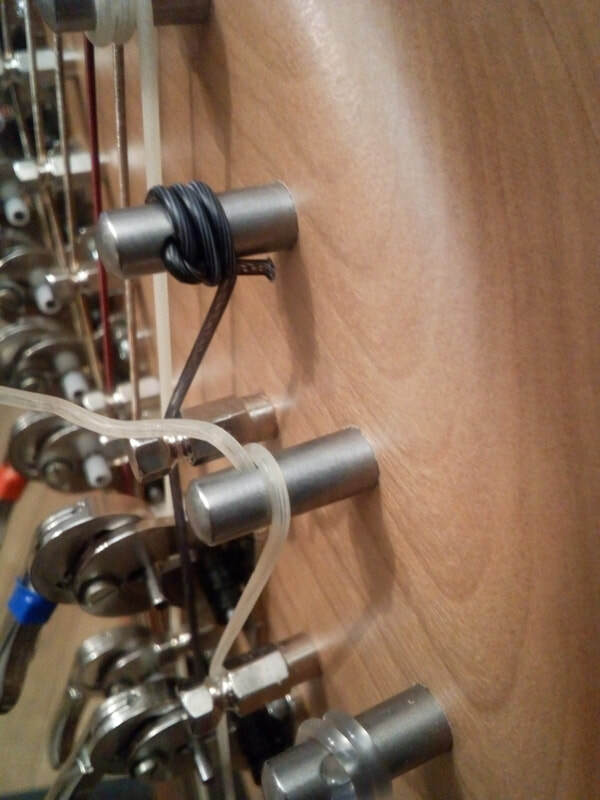 ​I was very wary of changing the wires and wanted to be super careful as I didn't want to do anything that would endanger the harp. 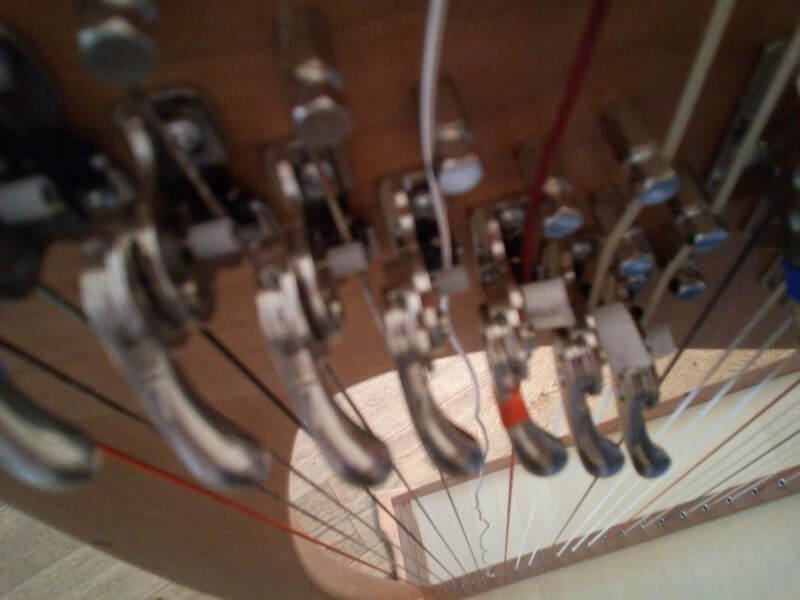 ​As luck would have it Billy 'The Harp Doctor" was in the area and giving my concert harp a service so I had a chance to pick his brain on the best type of wires to change to now that I had started on this project. 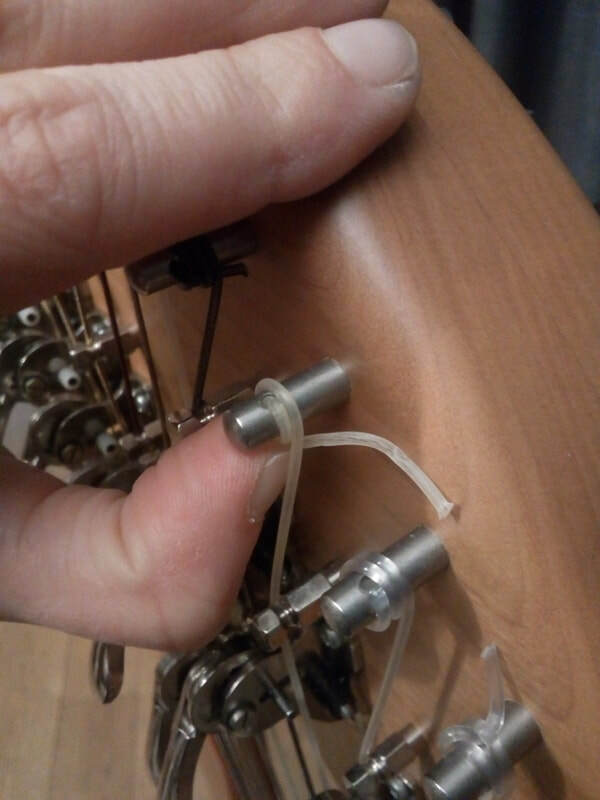 So, after a conversation with Billy looking at my harp and then a very helpful conversation with Salopian Strings over the phone, I ordered Multifilament wires for the first 3 wires 5th B, A & G <I had already changed the original 5th C, D & E wires to carbon fibre> and light gauge wire for the final 4 bass strings. So, whats in a multifilament wire string then? Normally you have the metal solid core wrapped in silk and then with the wire (silver, copper etc) wrapped round. As you can see above, there is no solid core!!! 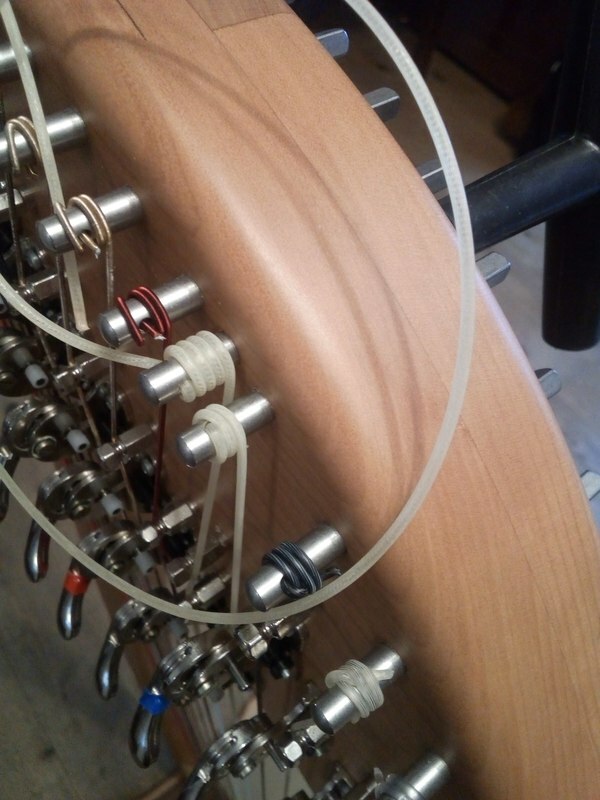 Which makes for a very funky & comical looking wire string as you put it on the harp. TBH I really thought that it wasn't going to make any sound at all, but WOW, what a great string. It perfectly bridges that sound gap from the carbon fibre strings above to the wire strings below. I took a gamble on needing 3 of these strings to bridge the gap before moving on to 'normal' wires at the bass end and I'm very glad I did as the sound blends really well. So how bad were the original wires then? ​Personally I hated the sound of them. The top ones were far too 'zingy' which is why I changed them as soon as possible to carbon fibre and the bottom ones had loads of variation of pitch as you played them. video above the original wires that came with the harp. 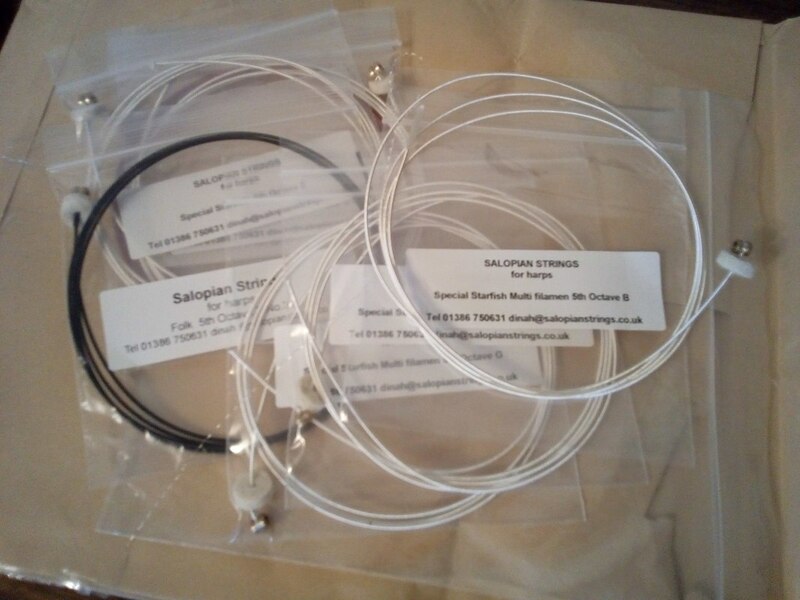 video below the new hand made wires by Salopian Strings. This is the wire with the solid wire core (not the special multi filament wire). For my personal taste, it's a much more mellow sound with very little 'wow' variation in pitch as it's played. Bear in mind I've literally just put this string on to the harp, so it needs to settle in to pitch. Next up on this project is some adjustment that needs to be made to the intonation with the levers. Some (not all) need adjusting now so that the pitch is true when you change the lever. ​After that, I'll be posting videos! Amy Turk does the most amazing videos and this one is no exception! Africa by Toto arranged and performed by Amy. The work that goes into the harp arrangements Amy does & the quality and production of her videos is incredibly impressive. You can support her patreon account here to help her create more videos for everyone to enjoy for free on the internet. The re-stringing I've done so far as been fairly straight forward and now it's on to the experimental side. 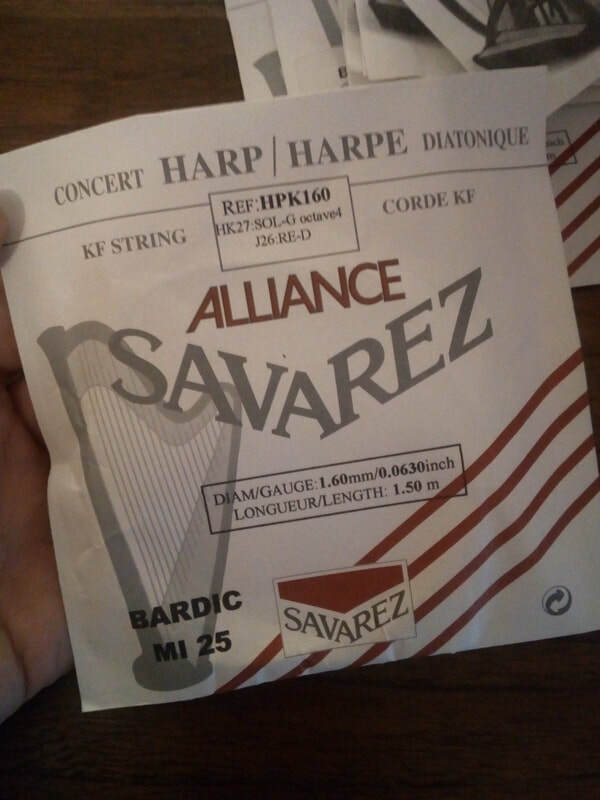 The strings I've used on the upper part of the harp are all NYLON [shock horror] and sound amazing! I'm really pleased with how they feel and sound. They are all the nylons used on the CAMAC Bardic 27 string harp, which is my other lever harp. 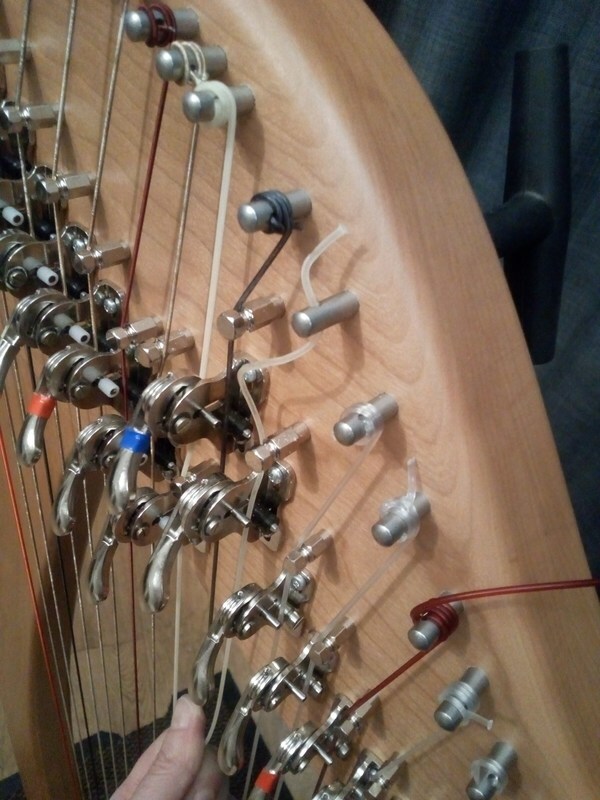 I have always loved the feel and sound of the Bardic, so when I decided to change the strings on this harp it suddenly occurred to me that I had a spare set of strings for the Bardic so why not put those on instead? ​From 4th octave D upwards the nylon strings sound brilliant, but the 4th octave C, B & A sound a bit dead and 'thumpy'. 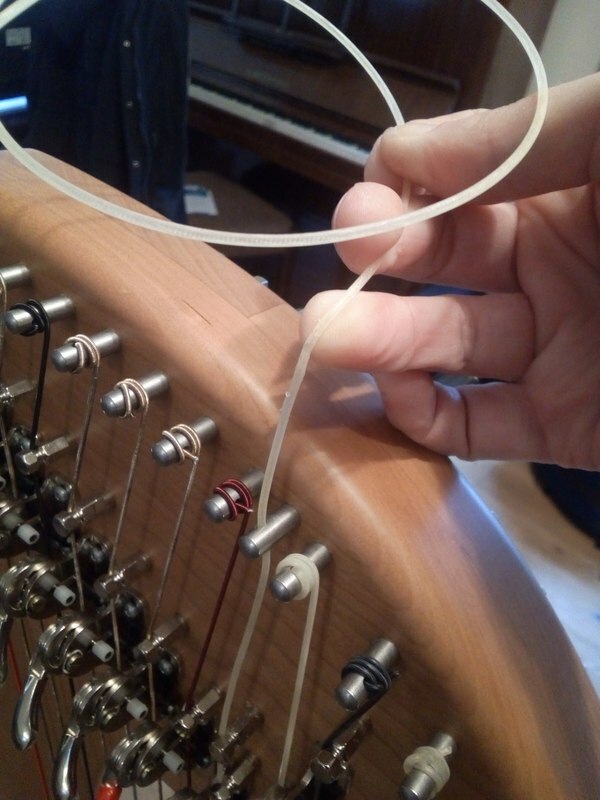 So I tried to source the correct gauge string from a harp shop, which was impossible! So I ended up going to a German luthier string supplier that sold all types of strings for different instruments from the Alliance range. 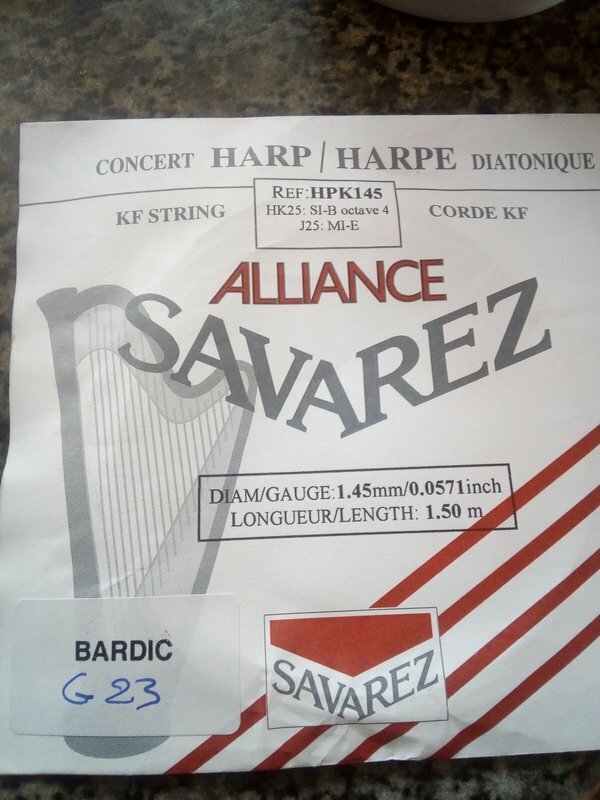 They had a harp section online but instead of the strings being listed by octave they are only listed by string gauge. Luckily they do lots of REDs and BLACKs in various gauges so you can experiment with the gauges. Taking an educated guess, I reckoned that the HPK136R was going to be the one I needed. The top string is the new carbon fibre that I have now put on the harp. The string in the middle is the ORIGINAL carbon fibre string that was fitted to the harp, which as you can see is much thinner. I found the original carbon fibre strings were too 'bright' and didn't feel to be the right tension. I'm assuming they were carbon fibre lever harp strings. 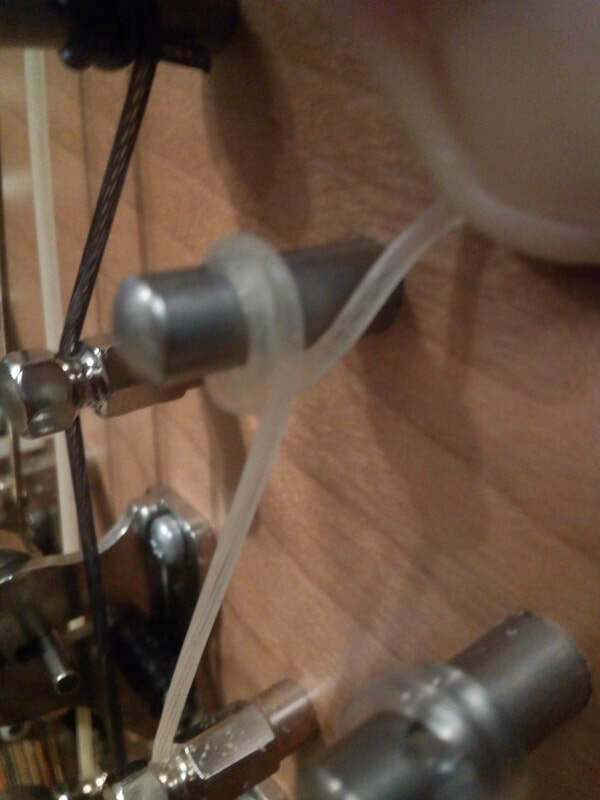 The bottom string is the nylon Camac Bardic string. The important thing for me was to have no jump in sound from the nylon string on the 4th octave D above to the carbon fibre 4th octave C. Which I'm delighted to say that now it's starting to settle in there isn't!!! I decided that I didn't like some of the wire strings as they sounded too 'zingy' after the carbon fibre strings so I started to replace a few. I carefully removed the wires without cutting them, so I could always replace them if necessary. 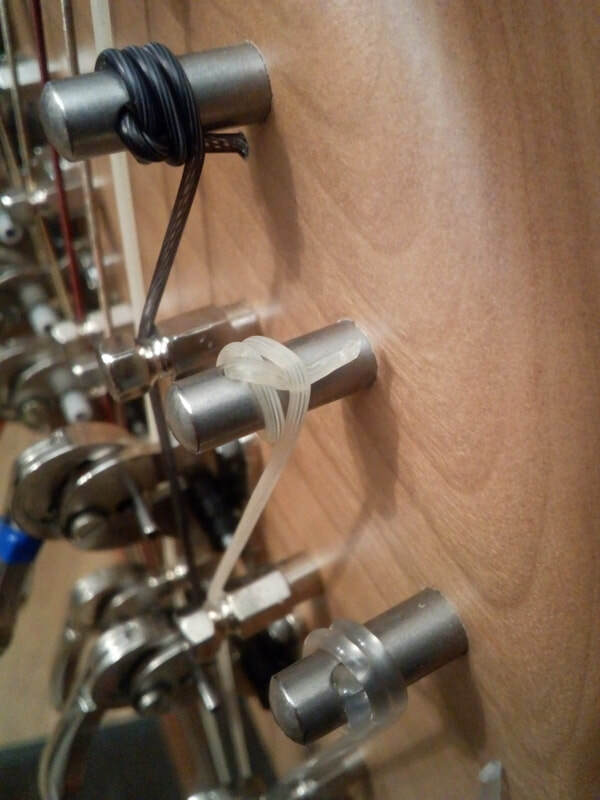 I decided to be a bit more methodical with the stringing this time, so I just wound the string on without catching the tail underneath the loops to lock on the pin. I kept tuning it every couple of hours for 24 hours. 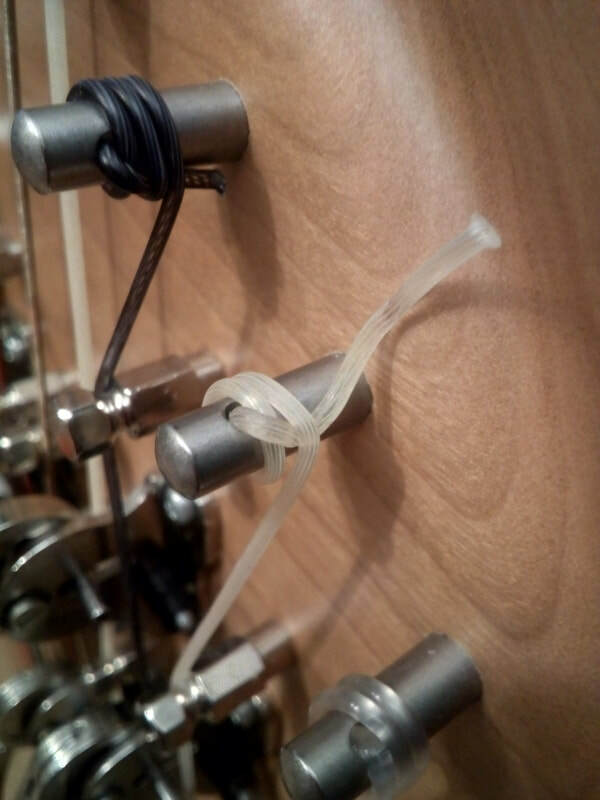 After 24 hours I carefully unwound it [see last post] and re-strung it so that I lost the excess (stretched) string. I checked it every day when tuning regularly, and after 5 days it looked like this. As you can see from photo above, it's a pretty much a healthy 3 coils round the peg. It still needed tuning constantly over the 5 days; but once that initial stretch is pulled through that seems to be pretty much it. I'm just going to carefully unwind the string now allowing for it to be turned at the point it's reached now and will tie the tail under so it winds over itself. Next thing is repeating this process with the next wire down which also sounds incredibly 'zingy'. I'm hoping that I can stop there as the B below has a different heavier sound which I think will blend better soundwise. I've been doing some experimental re-stringing on my lever harp and wanted to use carbon fibre strings. My goodness, those strings are slippery & stretchy and handle completely differently from gut strings. So this morning I finally worked out a way of handling them better and here are the pictures. 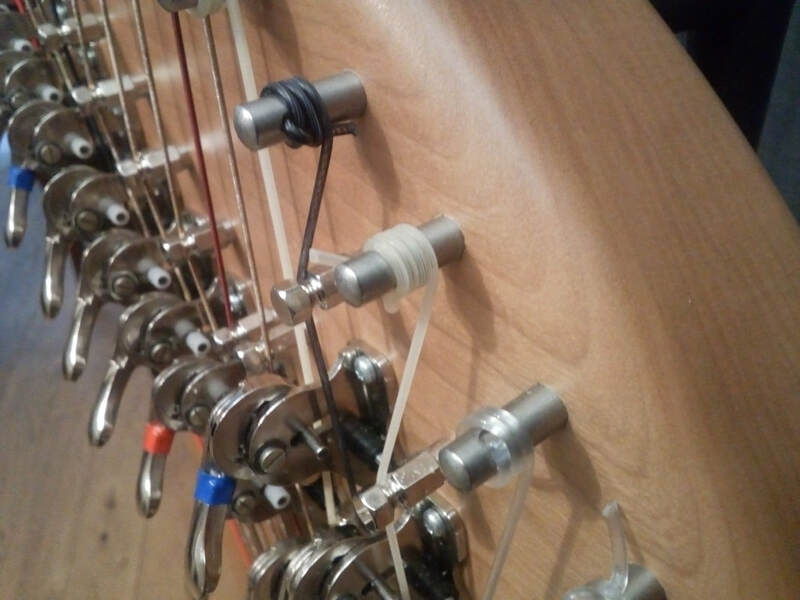 When I wound the string onto the peg, there was so much stretch in the string, it took loads of turns to get it to pitch. Then when you left it to settle, it took more turns to get it back up to pitch. It took far longer to get to pitch than a regular gut (or nylon) string. Which meant more coils round the peg. The G string above was not too bad an example in that is was only 4 turns round, but it was still going flat and need another twist round to sharpen to pitch. So I unwound the string making sure to keep the tension by hand as much as possible with the lower part of the string to create as little movement on the knot as possible. Then I pulled the string back up to take out the slack. Then I re-engaged the string to the pin from this new point. Don't leave any slack in the string - trust me it will stretch. 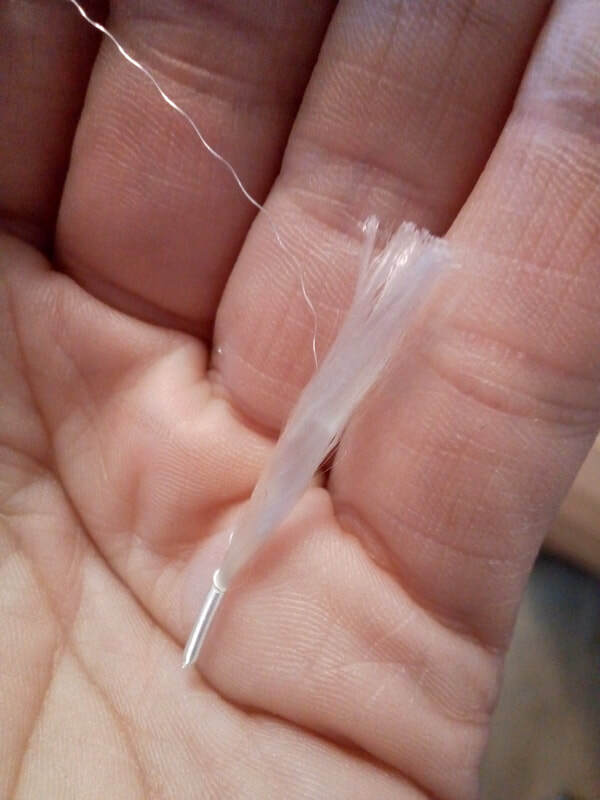 I had over 4 cm of extra string when I pulled it through; that is how much stretch and slack had accumulated over a period of 5 days from first putting the string on the harp. After one full revolution to then push the string towards the harp, so that now when it wound on it would lock and wind over itself. The important thing being to then trim the excess, so that eventually you would 'lose' the 'tail' under the coils as it winds on. You might think this all seems blindingly obvious, but trust me, using carbon fibre strings feels SO different to gut & nylon. 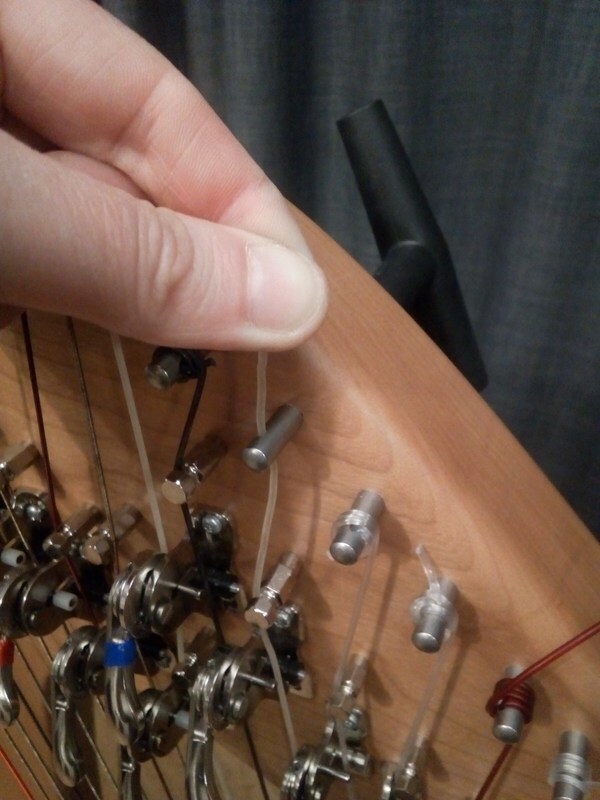 I think you need to double or triple the time you would normally spend stringing, tuning and settling in the string. HOWEVER... once it's settled and in tune, I think carbon fibre are brilliant strings. I'll answer that in my next blog post. Yesterday I had a white knuckle gig. Nothing to do with playing the harp, but the DRIVING involved in getting to the gig. 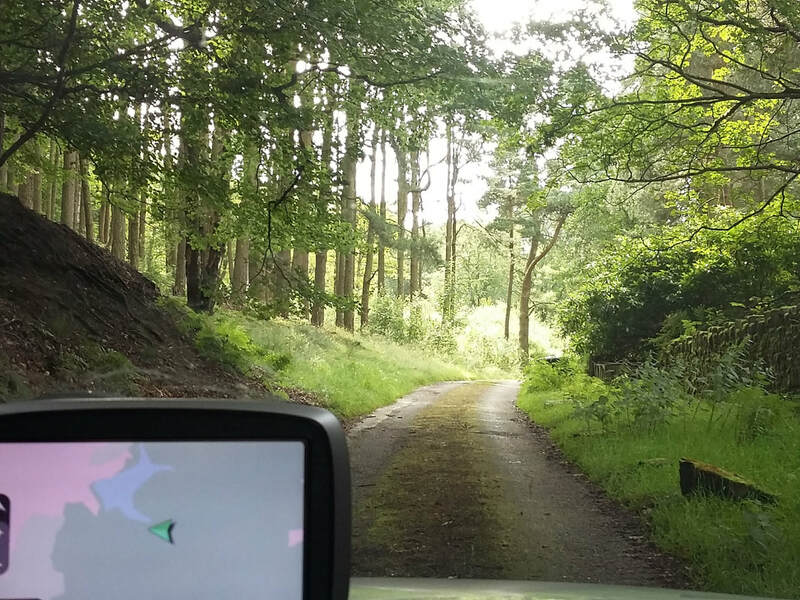 It was in a remote venue and the drive was slightly more 'interesting' than usual as for the first time ever my SatNav decided it was not even going to pretend I was on a road anymore. So I ended up with that nightmare of driving conditions that you don't need on the way to a gig. Having to put my foot dawn on the gas as I needed to be there for the start of the wedding ceremony. Single lane track up and down over hills with blind bends and very few passing places for traffic coming towards me. Absolutely no signs at all for the venue. No one to stop and ask that I was on the right road. "actually I'm a bit scared now and my vertigo is kicking in as I go up this steep bendy hill on a narrow path with a sheer drop to the side". 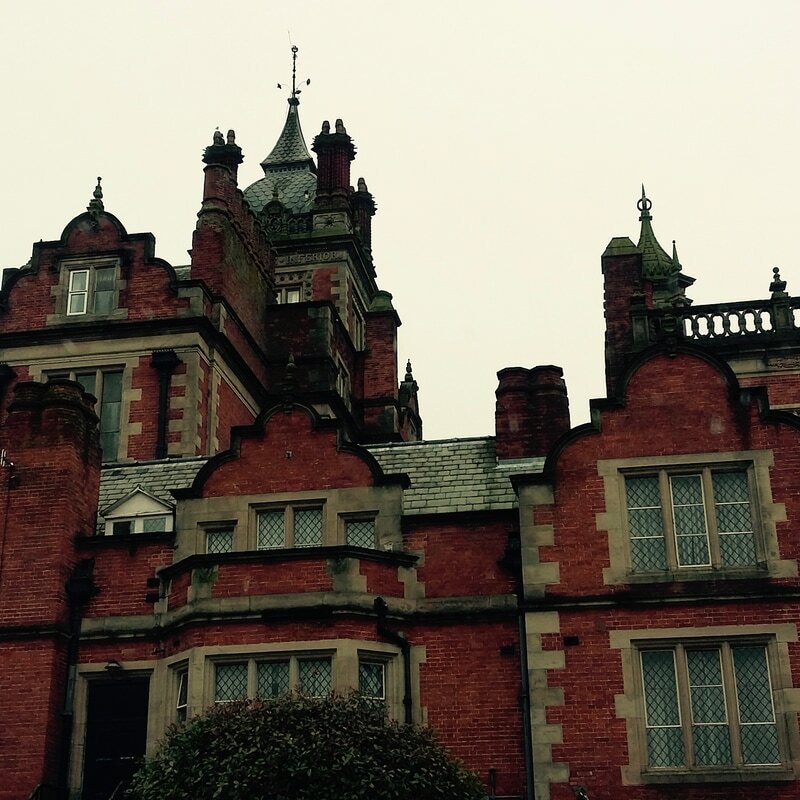 The actual gig was lovely with a beautiful venue and nice people. But I have to admit I spent most of the time thinking about the drive back home and being thankful that I would be doing the return car journey during daylight and that it wasn't raining. Being an outdoor gig meant as well that I was fighting the wind blowing through my strings and being picked up on my amp. I took a couple of short videos on my phone and unknowingly picked up the craziest effect of my strings vibrating. Seems an especially poignant day to be playing harp at a Citizenship Ceremony with all the political turmoil going on, but it was good to be part of something which shows respects and welcomes new citizens to the UK. I played at the very first citizenship ceremony for my local council when they started way back in 2004. ​Since then I have played at lots of these events, and I may be biased, but I do think my local council does a lovely ceremony which is really welcoming to the new citizens. Today's ceremony consisted of people from 12 different countries. Very often you will get several members from the same family (some being young children) all taking part in the process at the same time. 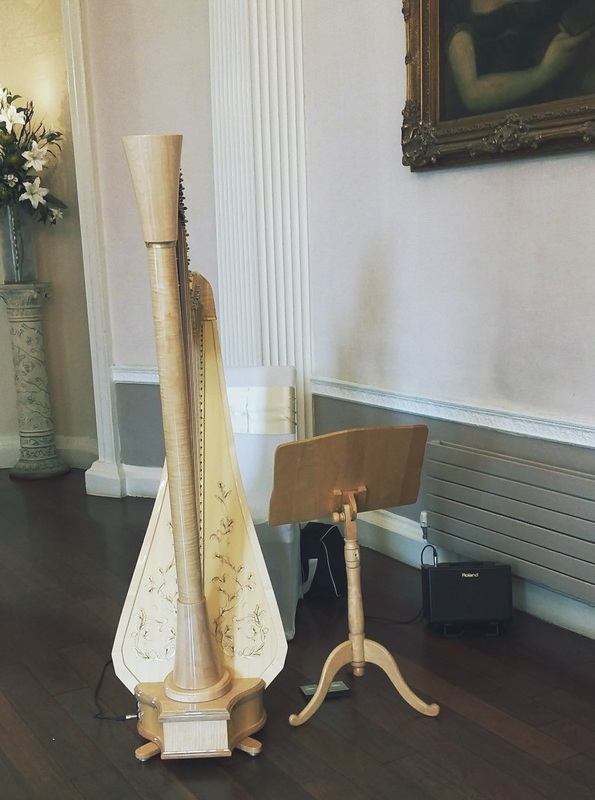 When they arrive prior to the ceremony, the harp is set up in the room where they have refreshments and I will play some music whilst they have some tea and coffee. The Mayor and a representative of either the Police or Fire Brigade, as well as the Queens Representive (either the Lord Lieutenant or one of the Deputy Lieutenants) will usually then mingle and chat to the new citizens prior to the ceremony. They then each give a short speech during the ceremony about the responsibilities of citizenship and being part of the community. ​Being the Queen's representative normally requires a bit of 'pomp' and over the years I've seen some great outfits worn by the Lieutenants. Everything from spurs, to velvet buckled shoes, to wearing a sword, to lots of lace and very big hats. It's great to have a bit of drama and personally; I love it! After the refreshments, it's a quick pack up of the harp and dash to the room where the ceremony is being held to play the dignitaries into the room. Then it's into the ceremony itself with the oath taking and the pledging of the allegiance to the Queen and the UK. I'm always very moved by these ceremonies. Often these new citizens have had a very long and hard journey to get to this stage, and this is always recognised within the ceremony. After playing more music whilst each new citizen goes up in turn to receive their certificate, sign the book and get their photo taken, the main event for the musician at these ceremonies is playing the National Anthem. It's a simple piece to play, but I'm always aware that this is very special moment for the new citizens as they all stand to listen to it. This is the end of the ceremony and the start of their journey as a British citizen. I always come away from these ceremonies humbled, and glad to be part of a country which shows respect, tolerance and welcomes new citizens. Ending 2016 with a bang! 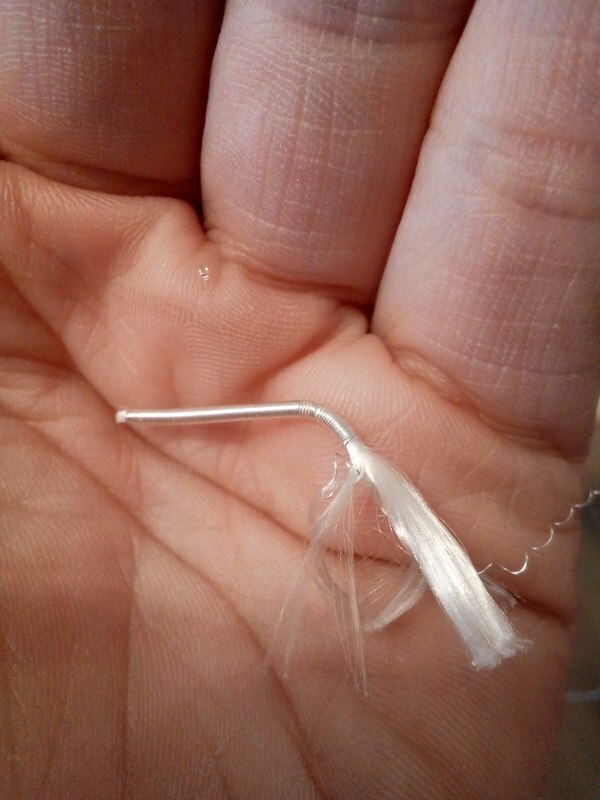 2016 ended with a bang (literally), when one of my big gut strings decided to unexpectedly snap during a really quiet piece in a New Year eve's concert at the Bridgewater Hall. Luckily it was near the end of the concert, but I've never had such a big string go during a concert before and it was all a bit shocking, for everyone including me! What a noise!! ​December 2016 has been an intense month of work with lovely people. It's such a joy to play good music, in good company. The majority of the month has been all about SNOWMAN with the wonderful talented people who run Carrot Productions. I'm not sure who looks more scary here... me or the Snowman!!! ​As well as the Snowman and seasonal favourites, this year's tour included The Nutcracker as well as a new production of Cinderalla with music brilliantly composed by Dan Whibley. The whole ethos of the Snowman show is so brilliantly devised and produced by Rachel & Dan and involves performing to so many young children and families, many of whom will not have heard a live orchestra before. It's not often you get such job satisfaction! ​We played 30 performances of the Snowman across Derbyshire, York, Hull, Sheffield as well as in Coventry and Chester Cathedrals, and finally ending at Blackpool Tower Ballroom. For me the highlight was a special performance at the Royal Manchester Children's Hospital. Prior to the Snowman tour, flutist Nichola Hunter and myself had done some outreach work for Carrot Productions at the Childrens hospital as well as in a Dementia unit in Manchester. Immediately after the Snowman finished Nichola and I did 4 performances of "a flute and harpy Christmas" which included one public performance and 3 private performances at eldery care homes in Cheshire; two of which were specialised dementia homes. Nichola is so wonderful and an absolute joy to work with and everywhere we played everyone loved her, especially when she brought out all her hand percussion for people to join in with us! These were very special performances and although it came right at the end of a busy work schedule just before Christmas, I'm so glad we made time to do them as it was an appropriate way to "give back" to our community. It's doing these kind of performances away from the concert hall and in the community that really brings it home how important music is for the mind, body and soul. A timely reminder that music is just magic! I can't believe it's been three years since I first blogged about using an iPad on gigs! My set up has changed a bit since my last post so I thought it was time to review what I'm currently using when I play at weddings and private functions. So the main change is that I invested in a new harp a few years back - my amazing electro-accoustic harp, a maple Camac Little Big Blue. What a beauty my Little Big Blue is, as well as being a complete joy to play! 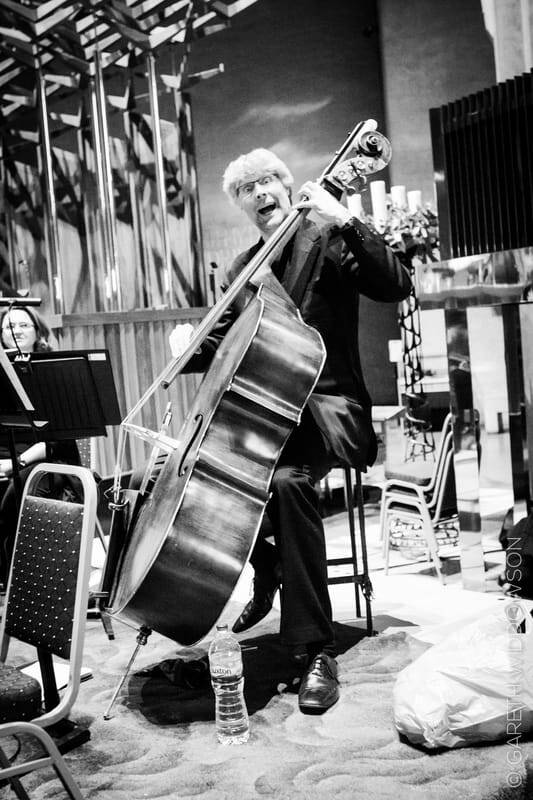 ​It has completely revolutionised my experience of playing at weddings and has made my life so much simpler in so many ways. Being a 44 stringed harp, it is physically so much easier to move around than my big Salvi, plus being amplified it is much easier playing for long periods of time. Playing outdoors is no longer a problem as I can usually find somewhere good (preferably indoors or in shade/covered) and just move the amp to where it's needed. I'm still paying off the loan for the harp, but it was definitely worth every penny. My amplifier is a Roland AC-33 battery powered guitar amp. It's small, powerful and best of all - battery powered. Before I got my Camac I experimented with amps and pick-ups on my Salvi and as well as not being satisfied with the amplified sound, just carting round all the gear was (literally) a pain. Being able to plug just ONE lead from the harp into a battery powered amp and switching the amp on and beautiful natural amplified sound coming out is brilliant. Earlier this year I had to finally accept reality that my eyesight is not getting any better and reading the music on my old iPad wasn't really working too well. ...the iPad Pro. I'm not an Apple fan, but you have to hand it to them for finally making what musicians needed; a decent sized screen for reading music. 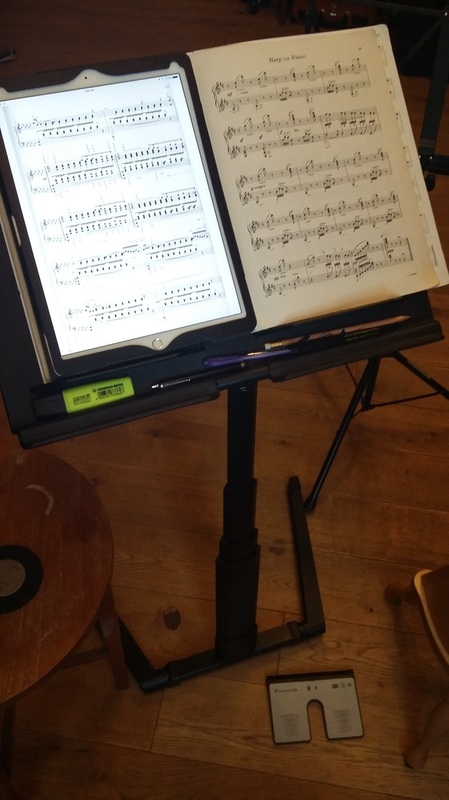 ​Plus there is the extra bonus of not needing a music stand light or pegs to hold down sheet music when playing outdoors. I'm still using ForScore software to view my music on the iPad, so that is still the same as my original blog post, along with using Dropbox to get it onto the iPad. The only change is that I'm now using a bluetooth foot pedal to change the pages of the music as I'm now reading the music '1 up portrait' rather than '2 up landscape'. It's taking some time to get used to an extra pedal to operate with my left foot, but it is well worth it. And that's it - all easy, light and quick to carry. Light years away from all the gear I used to carry round with me on gigs. In all the years I've been using an iPad, I have never had a problem with my iPad or the ForScore software. However that hasn't stopped the little nagging worries that somehow 'something may happen' and all the technology might suddenly stop working whilst I'm on a gig. For that reason alone I always carry a very small folder of one hours worth of printed sheet music that lives in the handy zip pocket of my harp cover. I have never had a need to use it. For size comparison - my iPad Pro on my music stand next to an old copy of Ceremony of Carols which is a standard 'oversized' piece of music. 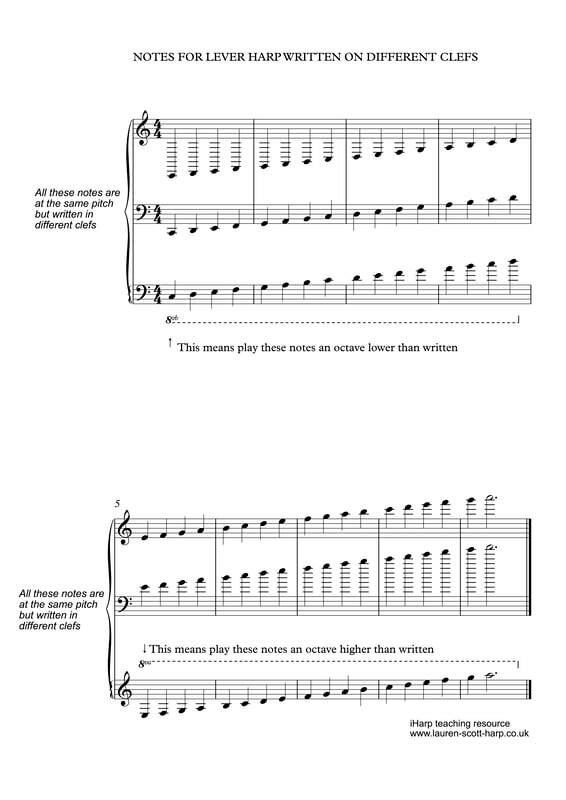 Most newly bought sheet music these days are the smaller A4 size which is around the same size as the iPad Pro. I use the standard model large iPad Pro which is - WiFi only, 32GB 12.9 inch screen which is more then enough space for a massive library of music. 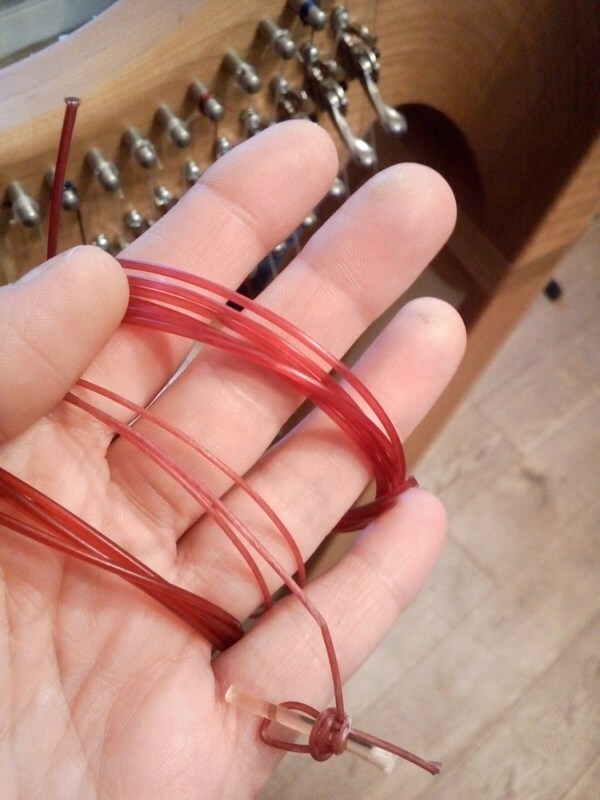 Having always tied my harp strings the same way for YEARS, I have very recently started doing them differently! 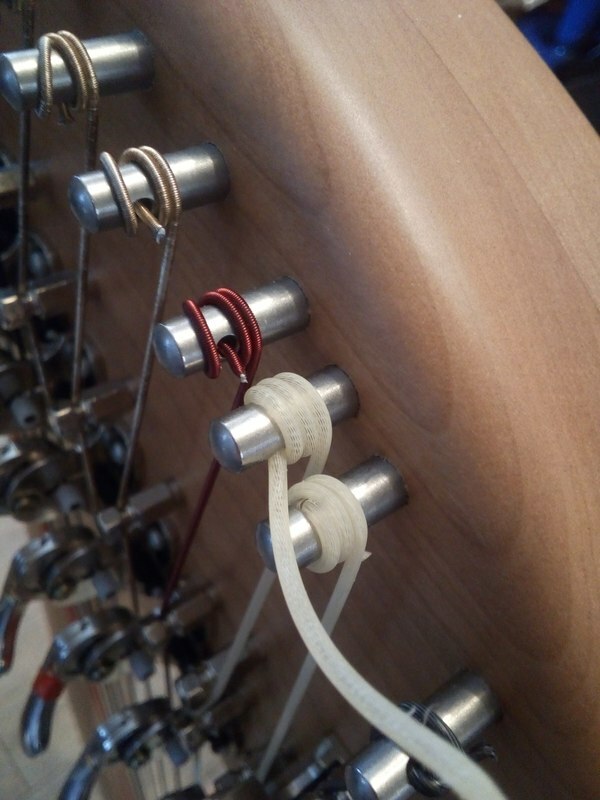 ​I'm now using wooden dowels instead of a bit of thick harp gut to secure the knot, which meant learning a new way to tie the knot. Like Pavlov's dog, it's going to take me a while to unlearn a lifetime of tying a knot a different way! But this new way is a simpler way (I think) of doing it, and for someone like myself who is a little bit dyslexic at times this is quick and works first time without being too 'fiddly' to remember. 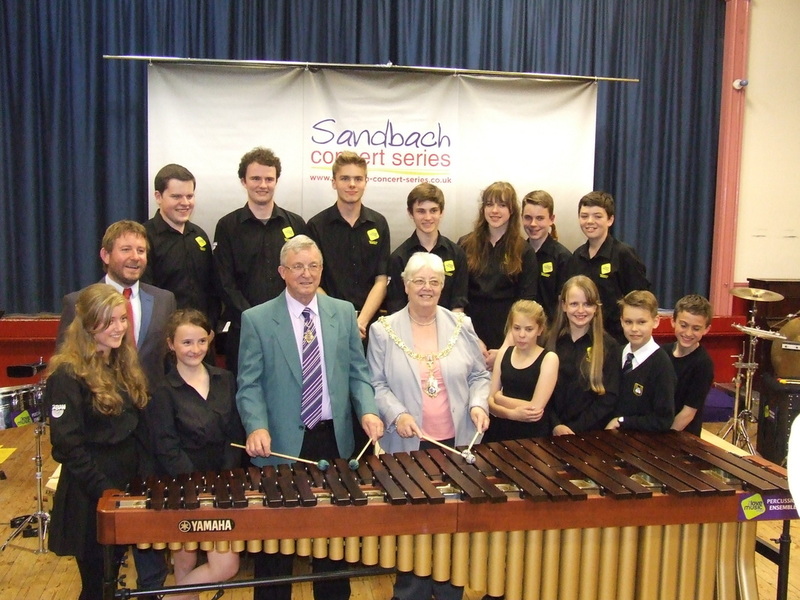 Who would have thought that when we first started the Sandbach Concert Series in 2010, that it would be going from strength to strength and that we would be celebrating 50 concerts being put on in Sandbach. 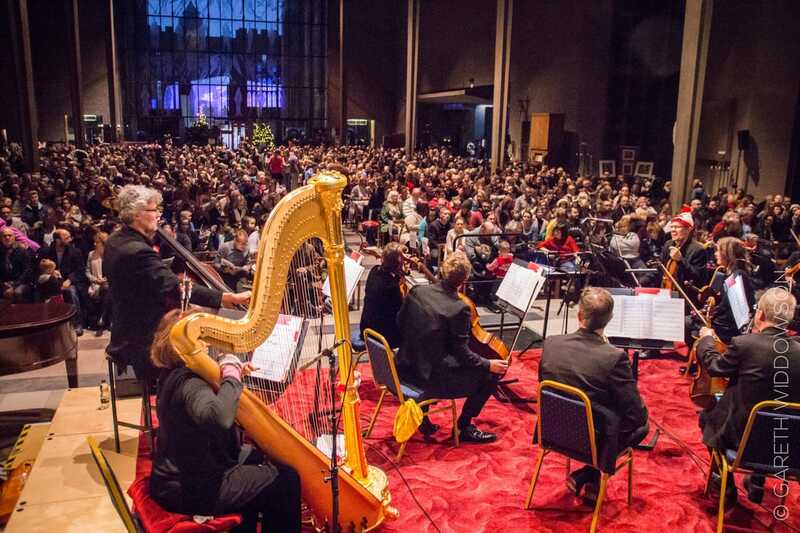 What started off as an idea and involved hours of filling in lots of grant application forms whilst on breaks working with the RLPO, has developed into an amazing concert series which has the community at it's heart. With eight concerts each year, helping to organise the concerts has been a huge part of my life for the past six years. At the start it involved friends and family all mucking in to help pull the first concert together, and very quickly volunteers from across the community came forward to help. We now have an incredible team of dedicated volunteers, without whom the concerts just wouldn't happen. I cannot stress enough how amazing it is to have so many incredible people involved in the organisation. 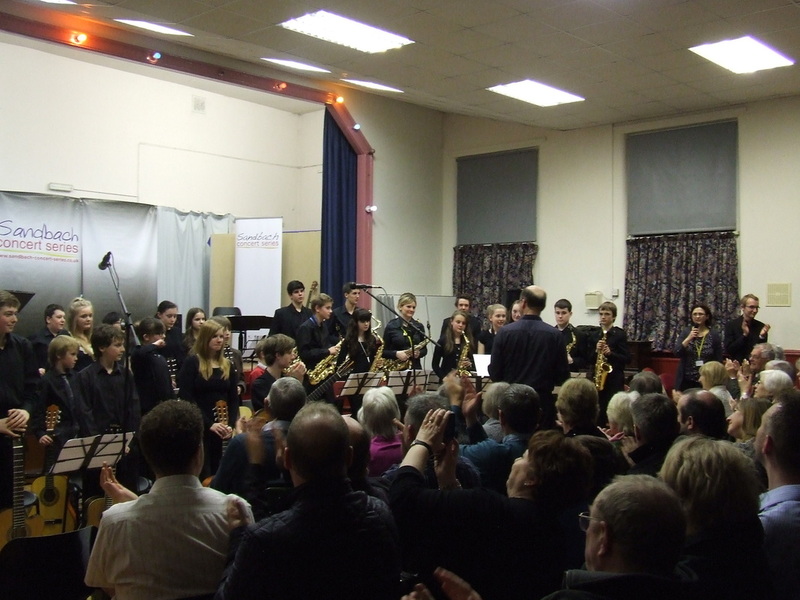 The set up of the concert involves a 30 minute 'spotlight concert' which involves young musicians from around the area, followed by a one hour concert by professional musicians. Incredibly we have had over 500 young musicians playing at our spotlight concerts, ranging from some who have only just started learning an instrument to those who are going on to music college. We are a welcoming and encouraging audience and all local young musicians are welcome to perform at our concerts. As you can imagine the spotlight concerts take a huge amount of organisation and rely on the support of the many dedicated music teachers in our area as well as being superbly co-ordinated and directed by music teacher and organist, Kevin Birch. We have always had an art exhibition on display during our concerts and we now have an amazing relationship with the Sandbach Art Club where one of their artists will put on an exhibition at our concerts. Community was always the central idea for the concerts which is why we have a 30 minute interval after the spotlight concert. Not only is it time to have a good look at the art exhibition and have a drink and catch up with friends, but we always have a local charity or good cause that we raise money for at each concert, and very often representatives will be at the concert. As well as the big household named charities, more often we support local grass roots organisations. We have raised an impressive amount for these good causes over the years with our raffles and it's always humbling to see how many good people there are, just getting on and regularly doing good things for others. 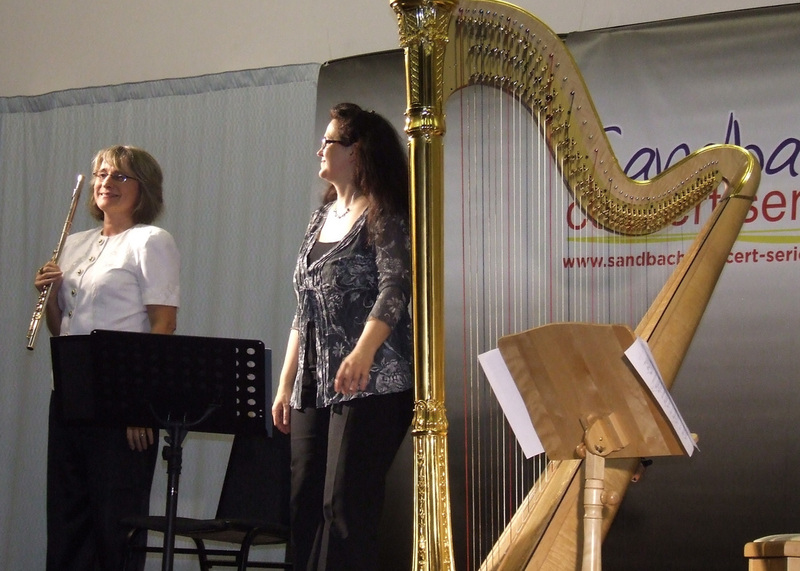 ​Thanks to my husband Andy Scott, and his great Artistic Director skills we have been spoilt with a fantastic range of musicians performing at the Sandbach Concert Series. From classical to jazz to folk, we have enjoyed a wide range of music brilliantly performed by amazing musicians. From an initial idea about how to do a successful community concert series, it has grown enormously. We now have charity status, have partnerships with our local music hub, The Love Music Trust so that we can also help deliver 3 educational workshops to young musicians each year. 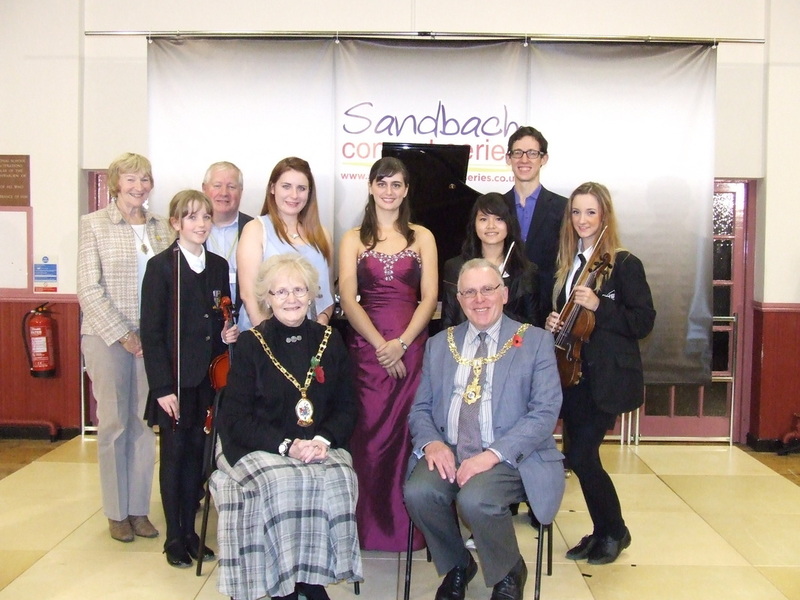 We also recently set up the SCS 'Young Musician of the Year' competition which takes place during the Sandbach Transport Festival each year. We are very grateful for the financial support we get from many local organisations, businesses and generous individuals. I can't mention them all here, but they are listed on the SCS website. Which brings me back to the next concert and the reason for this blog post! This time I'll be able to leave the set up of the hall for someone else to do for the September concert, but I'll be back to my usual role of chair shifting and hall setting up for the October concert when we have the Martinu Trio from Czechoslovakia performing. 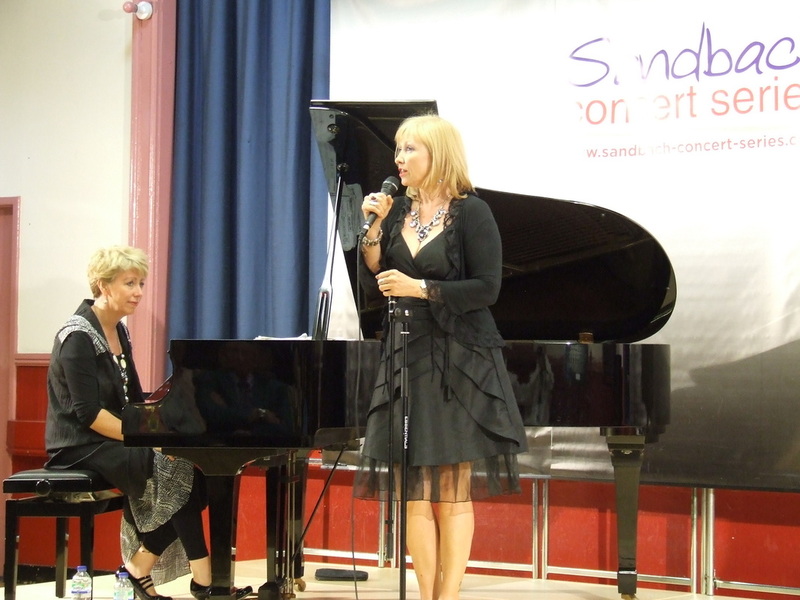 Thanks to all the musicians who have performed in Sandbach, all the artists who have presented their art work, all the volunteers who help to make it all happen, to all those individuals, organisations and businesses who support the Sandbach Concert Series and to our amazing audience.